ADL has introduced not one but two completely new models for specific niches within the overall coach market. The Panorama double-deck coach revives an old name last attached to a coach in 1975, while the second new vehicle is an additional variant of the Panther coach with a low floor ahead of the rear axles. Representing a total investment of around £4m the new coaches are both based on chassis combinations from Volvo; the new B11RLE 6×2 and B8RLE 6×2. Maintaining a broad range of products is a challenge for all manufacturers because of the investment required and the demands it places on the development team. Plaxton last built double-deckers-in 1990 but in 2012 took a big step in the double-deck direction with the Elite i overdecker, making the Panorama a logical next step. It has the latest Plaxton front and rear styling and looks a very convincing product. 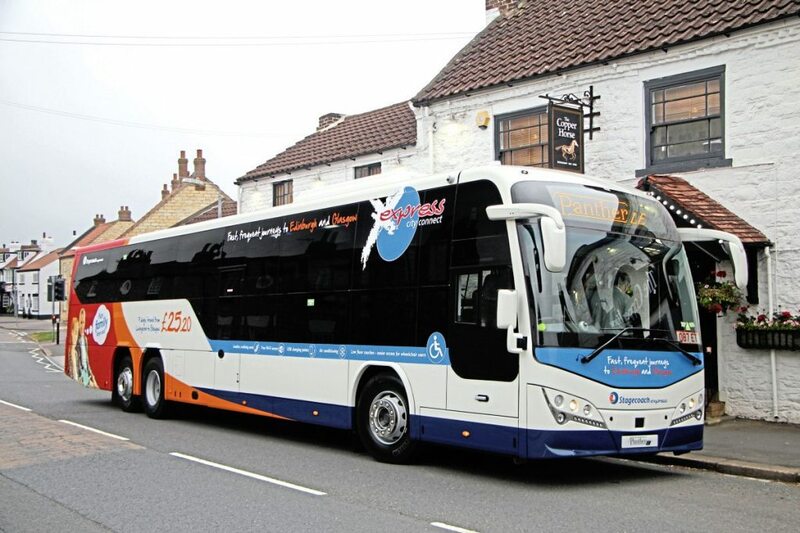 The introduction of both models has been underpinned by Stagecoach placing orders for them. 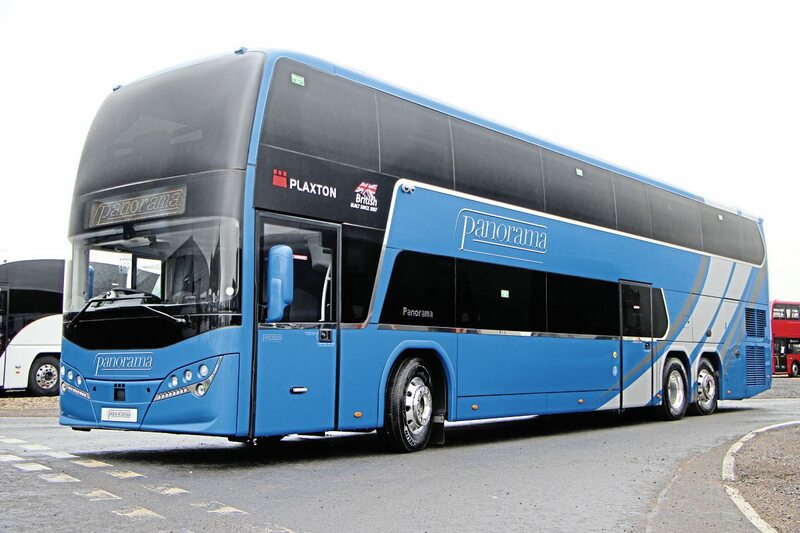 It is taking an initial batch of five Panoramas for the X76 service between Kilmarnock and Glasgow (replacing Van Hool Astromegas), while an initial batch of ten Panther LEs has already been delivered and a further nine were progressing along the lines when we were there. 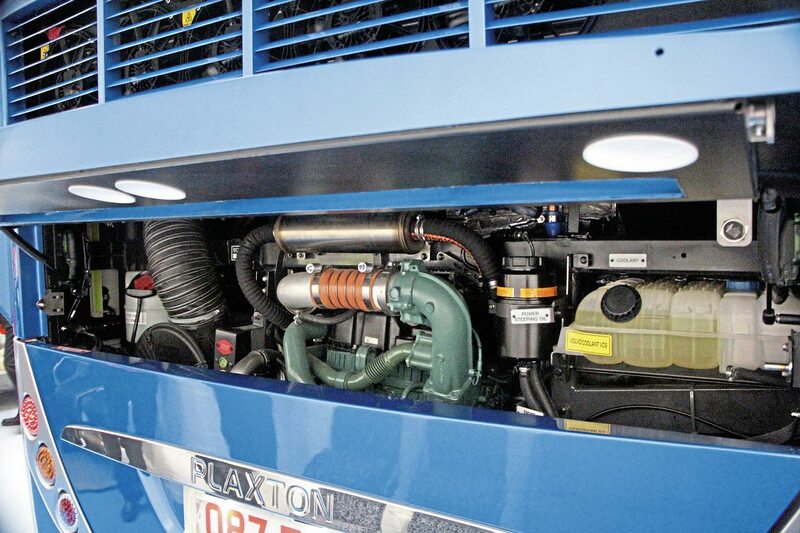 The Panorama is mounted on the B11RLE6x2 which unites a B11R rear bogie with the upgraded front unit from a B8RLE incorporating a 7.5-tonne axle rather than a 7.2-tonne unit. Plaxton had been asking Volvo to produce this option for some time and they brought in help from the Volvo empire, including Brazil which led the project, to accomplish it. It comes with the D11K engine as standard, rated at 460hp. 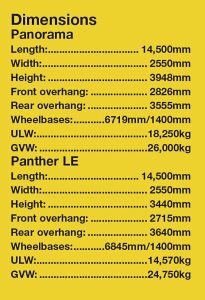 The B8RLE6x2 beneath the Panther LE was already available as it is used for Volvo’s own 8900 range, but I believe it is the first application for it in the UK. This has a 350hp DK8 six-cylinder 7.7-litre engine. Both ZF EcoLife and Volvo I-Shift transmissions are available on both models. 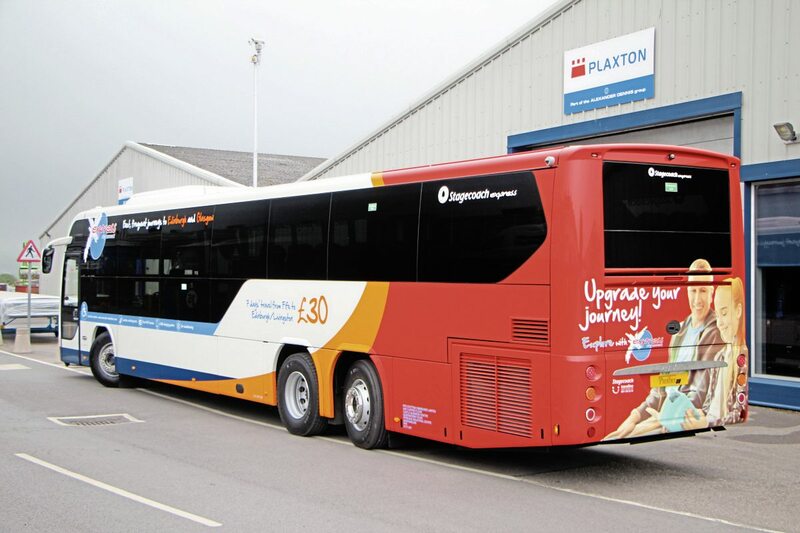 Reviving one of the best-known names from the Plaxton back-catalogue, Plaxton’s marketing gurus have christened the new double-deck the Panorama, harking back to the large-windowed coach design of the 1960s, a move that has met with approval with those I have spoken to. Structurally the coach, which meets the latest ECE R66.02 rollover regulations even though there is no requirement for a double-deck to do so, has framework in 12% chrome steel, a one-piece aluminium skinned roof, single-piece GRP main side panels and aluminium-skinned locker panels on 12% chrome steel frames. Front and rear panels are also GRP bonded and fixed in place while the windows are all double glazed, the front screens being heated. 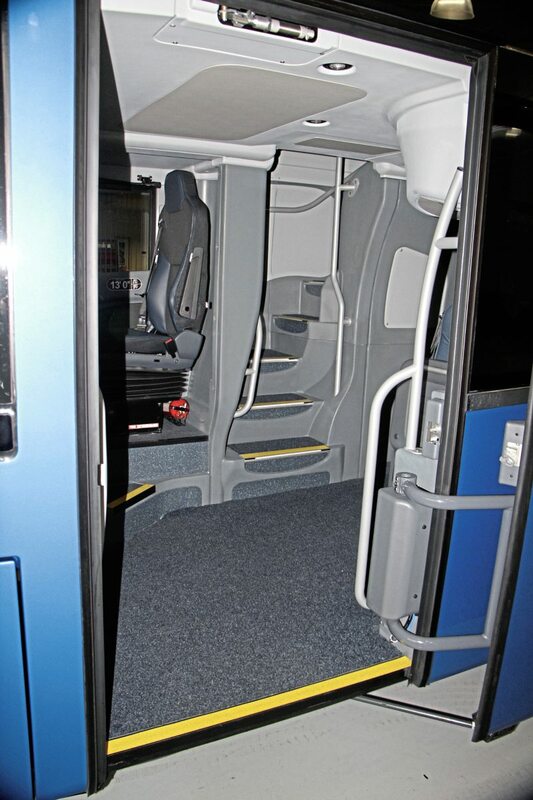 On many double-deck coaches the centre door is the primary entrance but the Elite is designed so that a wheelchair could enter through either doorway, with a detachable ramp provided which stores on the back of the luggage bay door when out of use. 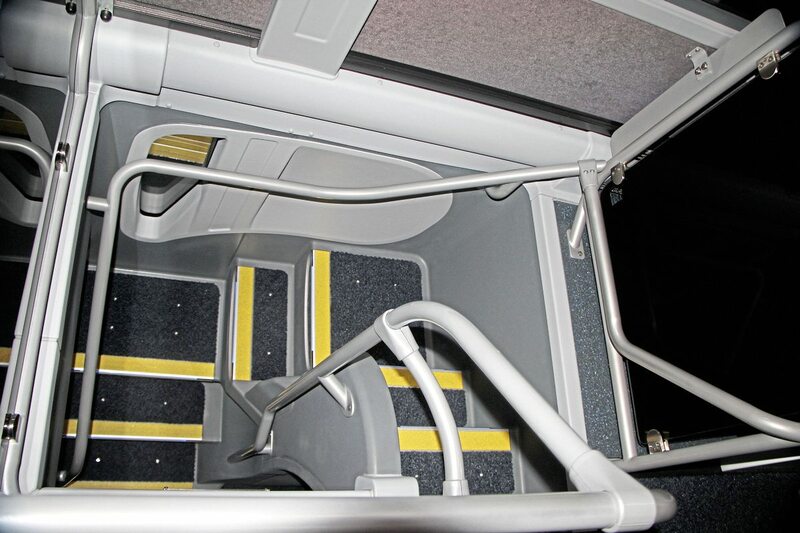 Passengers boarding through the front do not have to negotiate their way past a courier seat, drinks machine or other impedimenta to reach the front offside staircase or the lower deck, because the floor arrangement enables them to get straight through. 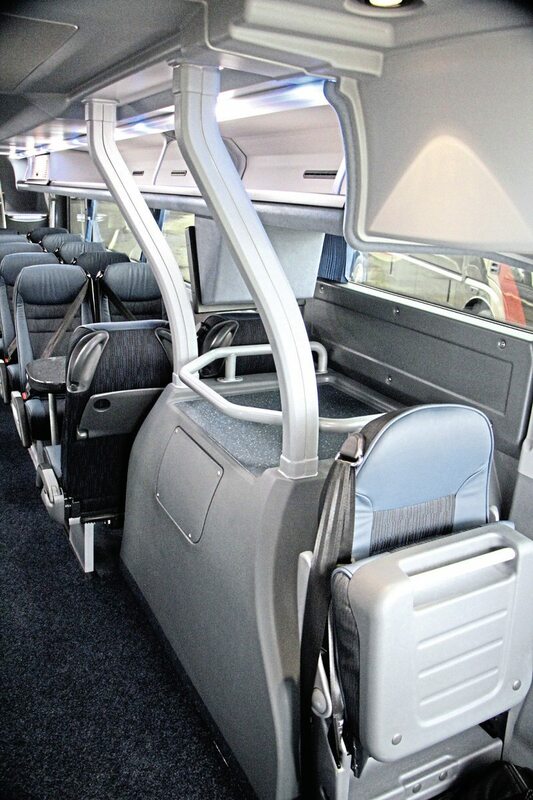 There is a courier seat, but it is well back against the forward edge of the wheelarch, which has two curved pillars on it that connect with the ceiling as well as a small luggage pen area. Height in the lower deck is good, with sufficient space for proper luggage racks. One criticism is that the bottom window line could usefully have been a couple of inches lower. At the rear of the saloon there is a Shades water flush toilet on the offside complete with warm-air drier. Baby changing tables and stainless bowl and litter bin options are available. On the forward external face of the unit is a small servery which Stagecoach will replace with a wheelchair restraint stowage box on their vehicles as they will be having a permanent wheelchair bay at the rear. The tracking for this is provided on all examples. A second staircase is to the right of the centre door on the nearside with both sets of stairs amply provided with rails and benefiting from lighting on each step edge. Both the front and centre door are powered plug units. 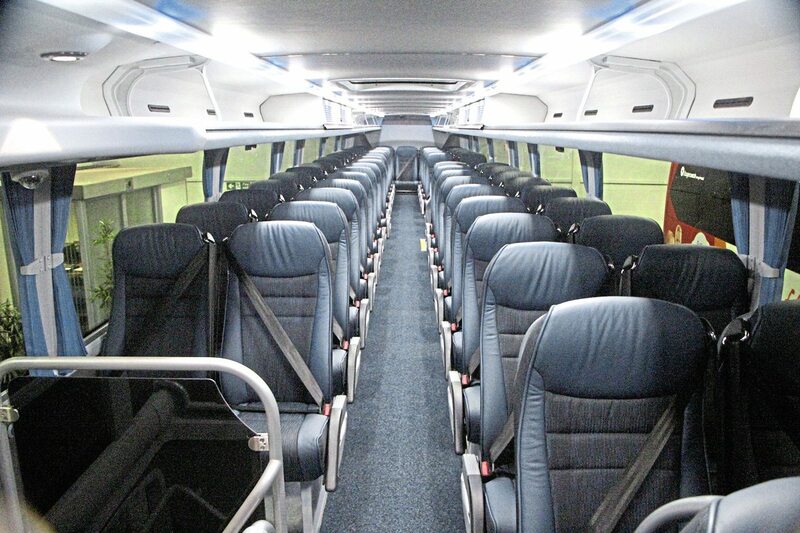 The upper deck also offers good headroom for a double-deck coach and, again, it has proper racks with passenger service units in the undersides. 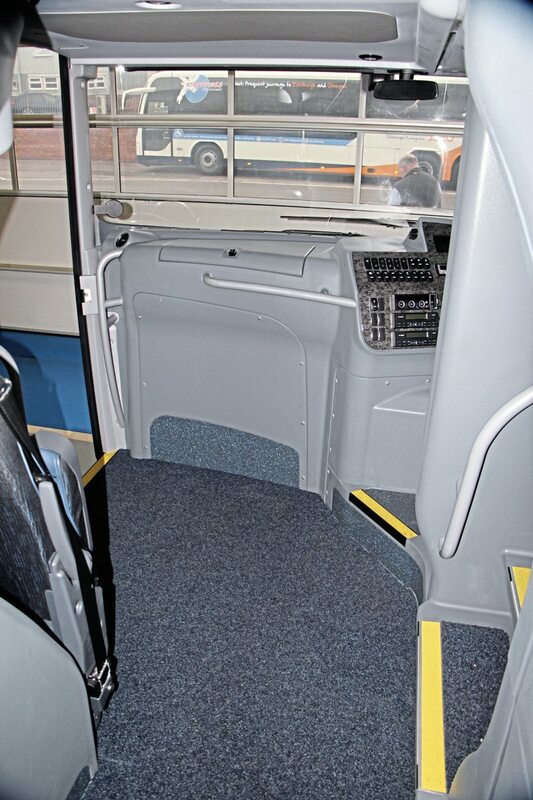 Apart from the step up at the back on which the rear seat row is mounted, the floor is flat for the length of the coach and there is nothing to surmount to reach the front row of seats. The view from all seats is good. Interior lights are all LEDs as are the exterior ones apart from the head and fog lights. 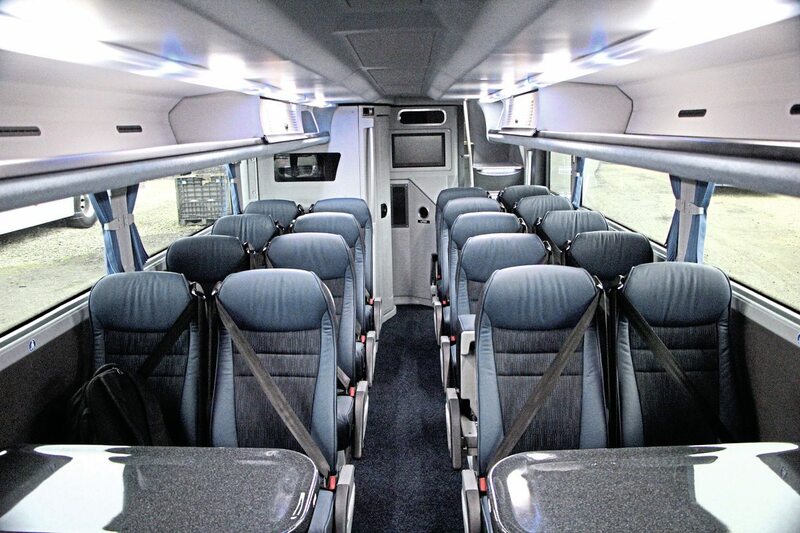 In terms of seating, the standard configuration is 87 (65 upstairs/22 downstairs) to full coach specification with the toilet in place, though this can be increased to 91 if the toilet is not installed. Different seats can be specified; the launch coach had the Kiel Avance 1020 units with leather edges and three-point belts. 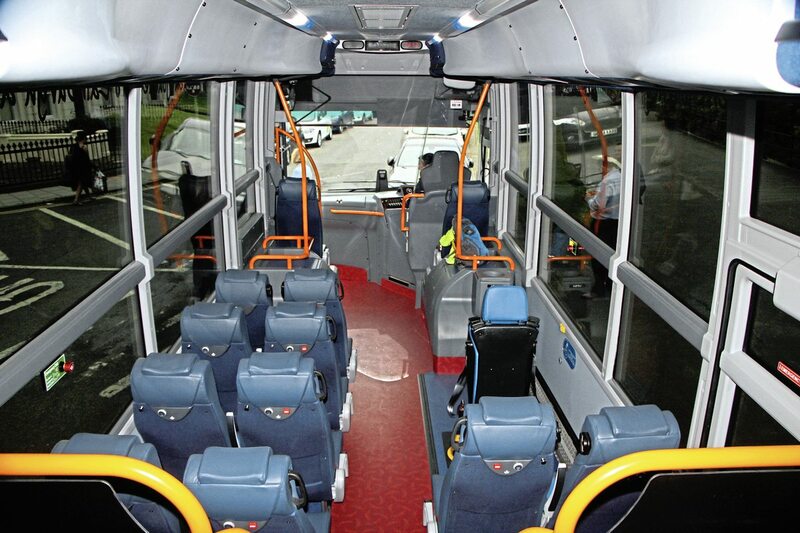 Stagecoach has specified its first batch with 83 seats and a fixed 1,300mm wheelchair bay immediately ahead of the centre door. Tracking for demountable seats is standard in the area designated for wheelchairs and an NMI wheelchair restraint system is standard. Driver’s compartments are never massive on double-deck coaches and this isn’t either, but there is room for everything. Gull wing exterior and blindspot mirrors are heated and powered, the signalling window is also powered, as is the front screen blind. An E-Leather trimmed Isri air-suspended driver’s seat is standard. There is cab air conditioning and a Bosch PA and pedestal microphone as well as an MP3 player installed. 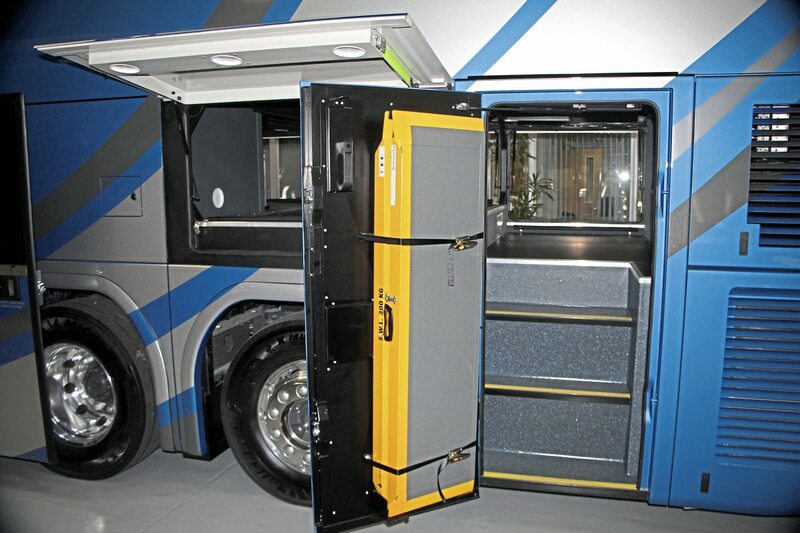 A driver’s cab partition with cab door can also be selected but hopefully only for express bus applications. Both ski-box and trailer options are currently being engineered for those that want them. A good aspect is the full-height door that makes all the space that there is accessible, further helped by top-hinged locker doors, one on the nearside and three on the offside. Other aspects of the specification include a multiplex electrical system, Hanover LED destination equipment to the front, side and rear, integrated air conditioning and provision for CCTV system installations and wi-fi systems. 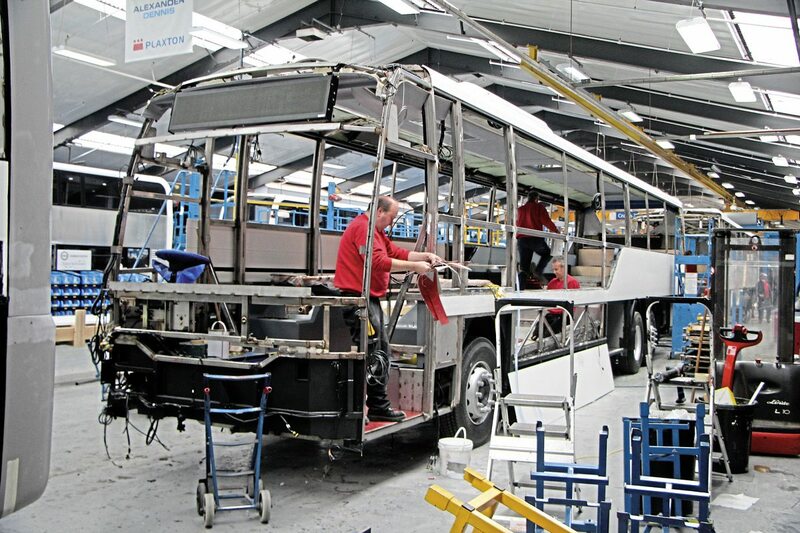 There are no current plans to do so, or orders placed, but Plaxton would be interested in building the Panorama in left-hand drive format for export orders. It looks like a Panther III coach from the rear and it looks like a Panther head on, albeit one with full destination equipment, but from the side there’s never been a Panther quite like it. Although certified to Class 3 regulations as a coach, the window line to a few feet ahead of the rear bogie axle is that of a low-floor bus, though admittedly a very tall one. Beyond this it is pure Panther. The deep side windows are in two parts, the lower in flat glass and the upper curved, which should make replacement easier and cheaper should a breakage occur. 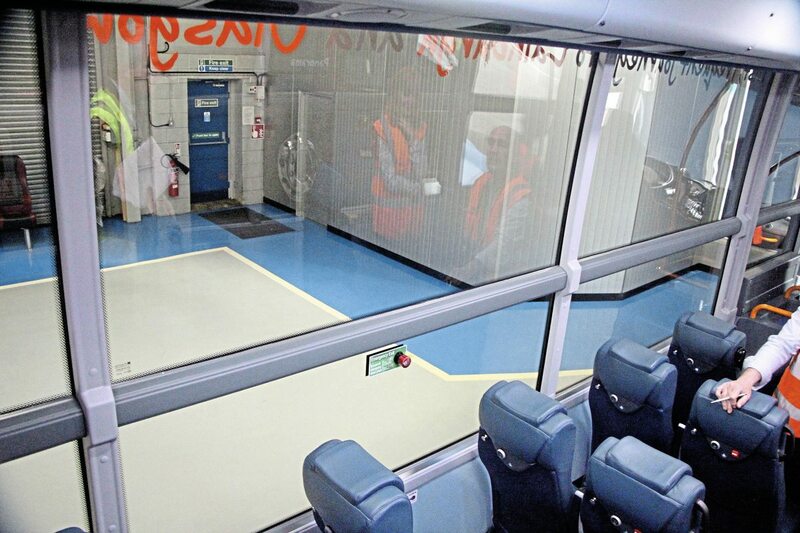 You don’t immediately notice it but between the low-floor section and the rear there is a 2m³ luggage locker across the width of the coach, and also somewhat disguised by the large area of tinted glazing is the full-height offside emergency door to the rear of the low section. If it looks different on the outside, the inside is even more of a surprise when you board. Put simply, the forward section is cavernous. It’s like a cathedral on wheels. The lockable lockers (for video or other equipment) are so high that you can’t reach them without standing on one of the wheelarches, and then only if you are reasonably tall. From the spacious entrance, the floor slopes up gently towards the rear until, several feet ahead of the rear axle, there are three steps, after which the floor is flat until the final step ahead of the penultimate seat row. The centre steps effectively split the interior in two, the low floor front section with its extra deep windows and the raised rear section which is pure coach, with luggage racks, service units and the view out you associate with a coach. Downstairs there are 16 high-back coach seats and on the offside an extra-long wheelchair bay with permanently fitted forward facing wheelchair restraint with associated fittings. Upstairs are the bulk of the seats, 37 recliners, giving a maximum capacity of 53. The view from the front seats of what is effectively a gallery is excellent. Like the Panorama it is stainless steel framed and available with the choice of ZF EcoLife or Volvo i-Shift transmission. The fuel tank capacity is 300 litres with a 48-litre AdBlue tank. 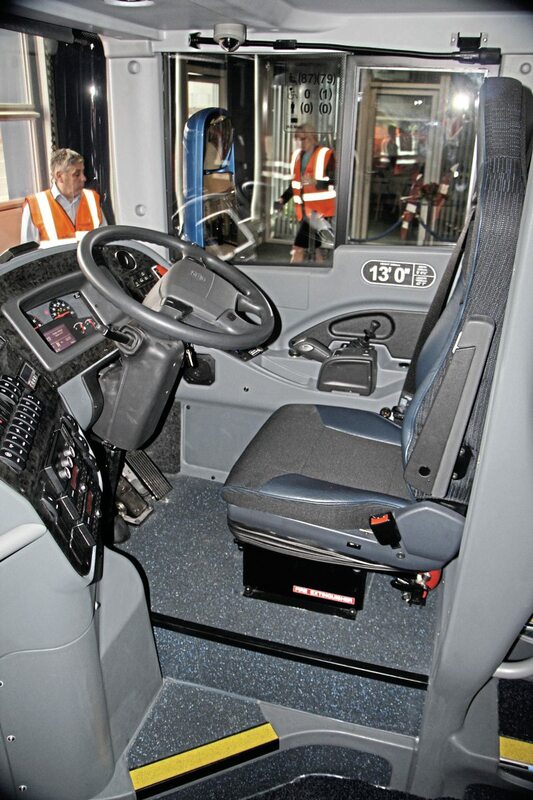 For the driver, the cab has a full-height partition to the rear and a cab door, while the dash is a development of that for the Elite i incorporating ticket machine mounting and a locker. Described by ADL as ‘A new concept in fully accessible inter-urban coach travel,’ the Panther LE is intended for inter-urban routes, express services, airport shuttles and ‘other operations where both comfort and easy access are important’, which could well include vehicles for specialist charities. Stagecoach will be using it on express service between Livingston and Glasgow. With these two new models, the range of coach options on offer to customers is the biggest it has been for several decades which is no mean feat, given the legislation and testing requirements that have been introduced in the interim. 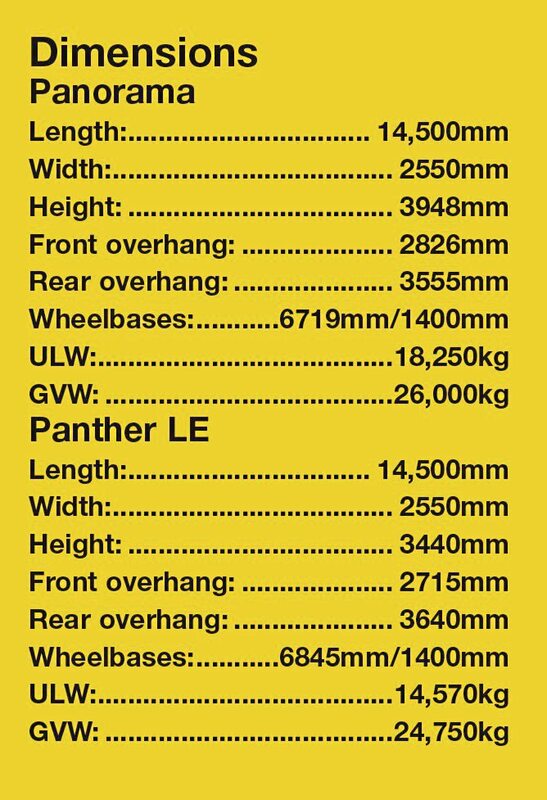 Plaxton now has the Cheetah XL, Leopard, Panther, Panther Cub, Panther LE, Elite, Elite i and the Panorama in its range, all of which stand up well against their competitors and have advantages over some of them, particularly with regard to weight. It would be nice to think we might see European sales but realistically this would be difficult without access to a pan-European support network, though it might be possible through a tie up with Volvo. It would be good business for them: I don’t see too many double-deck Volvo coaches on Europe’s roads these days. It is always difficult to do on a high-capacity double-deck but I would have liked to see a bit more luggage room in the rear luggage compartment than the 6.80 cubic metres there is. 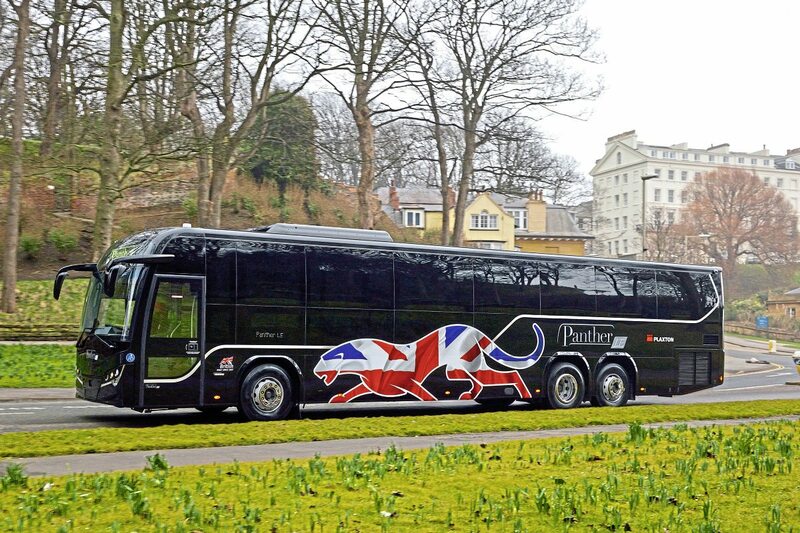 This puts it on a par with most competitors rather than ahead of them, the Van Hool Astromega offering 6.50m³ in the TDX25 and 7.20m³ in the TDX27 and the Setra TopClass S531DT giving ‘approximately 8.4m³’. In designing the Panther LE as effectively both a coach and a bus simultaneously, I find it difficult to assess its appeal. It’s a very long vehicle to only carry 53 passengers, but this could be answered if a Class 2 version was produced, giving you approximately 17 additional standees. The downside of such a move is that standees would tend to take away some of the ‘coachiness’ of it. And you’d also have to choose what routes you employed it on pretty carefully. Then again, if you see it as a coach, then it doesn’t have a tremendous amount of luggage capacity. There is some, but probably not enough to turn up in Victoria and expect to cope with a full load of passengers going home for Christmas. 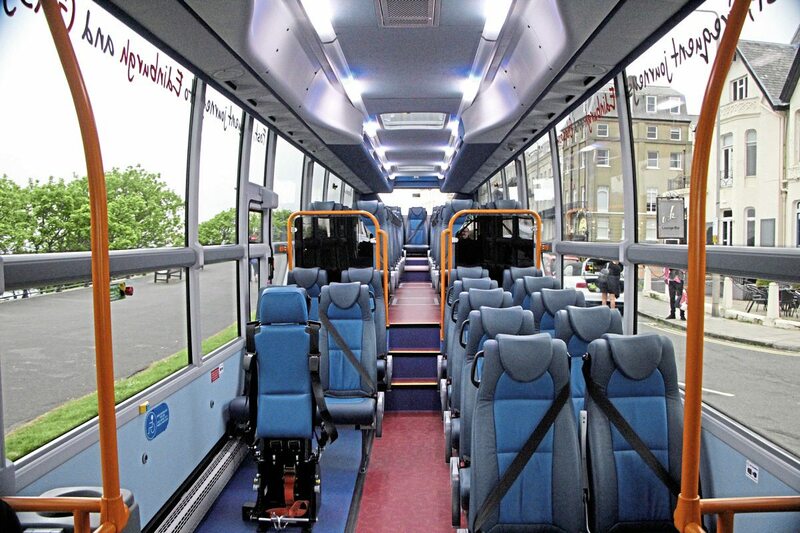 I applaud efforts to make public transport more accessible for everyone and on a just-turn-up basis, but in truth the low section is less ‘coachy’ than the rear, without the services units, though the seats are exactly the same. Shorter versions are possible; indeed the Stagecoach vehicles were originally intended to be 13.8m until it was decided that four extra seats were needed. Yes the capacity is important but a 13.8m vehicle would be a lot easier to allocate and looking at it purely commercially, you could buy that sort of capacity with posh seats and probably less easy wheelchair access for a lot less than this will cost you. It is impressive and I like it, but I’ll be interested to see how practical it proves in operation. It does occur to me that it could be the basis for a new type of touring coach. The top touring companies are seeking to increase legroom while introducing lounges and other facilities. Could you use it to make a coach more accessible to those in wheelchairs, or those who just struggle with stairs of any kind, and add the toilet and servery and possibly a lounge area in the lower section. Luggage would still be an issue but it would certainly make a person incapable of climbing stairs feel more included than sitting them separately in a lounge area next to the driver as on over-decker solutions. I don’t expect either of the new additions to be the range’s biggest sellers, but any business they win is likely to be incremental which helps to keep Scarborough busy and justify ADL’s ongoing commitment to the brand and the plant. 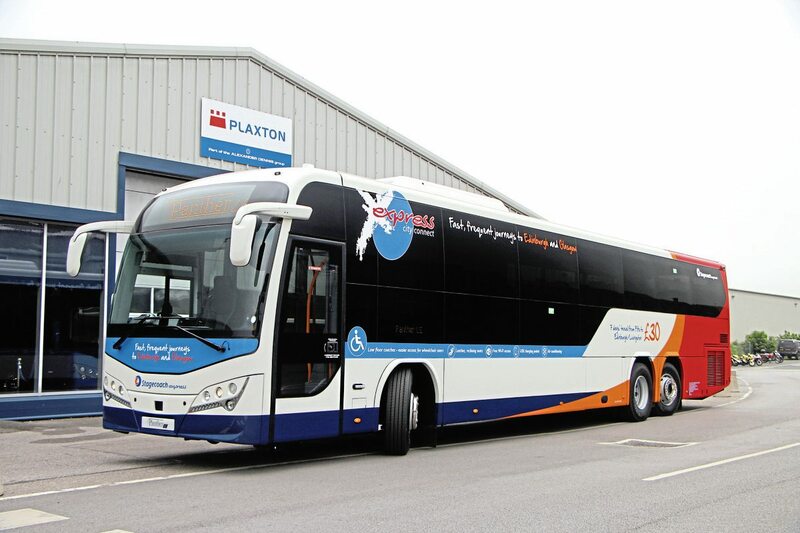 Those who thought ADL’s acquisition of Plaxton a decade ago signalled the end of coach production in Scarborough could not have been more wrong. 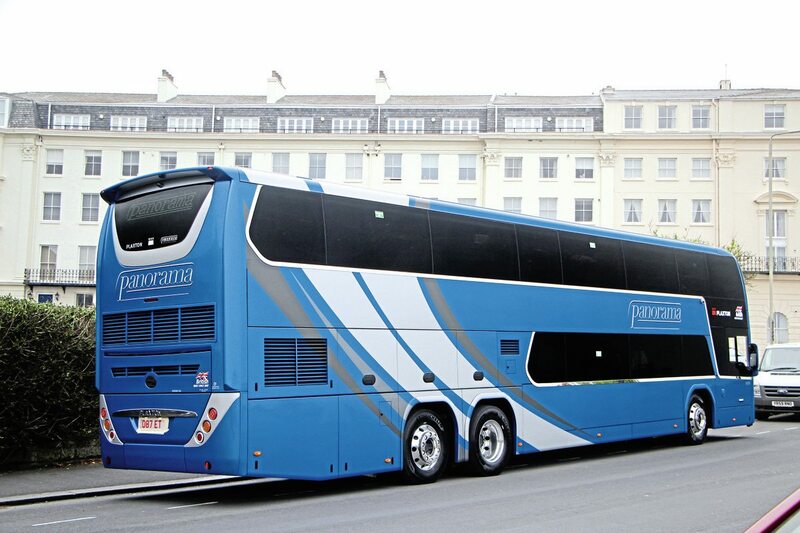 It is approaching 30 years since Plaxton last produced full double-deck luxury coaches, though in recent years it has offered the Elite i overdecker with front lounge/wheelchair bay for both express and touring customers as well as building thousands of Enviro 400 buses including coach seated versions. 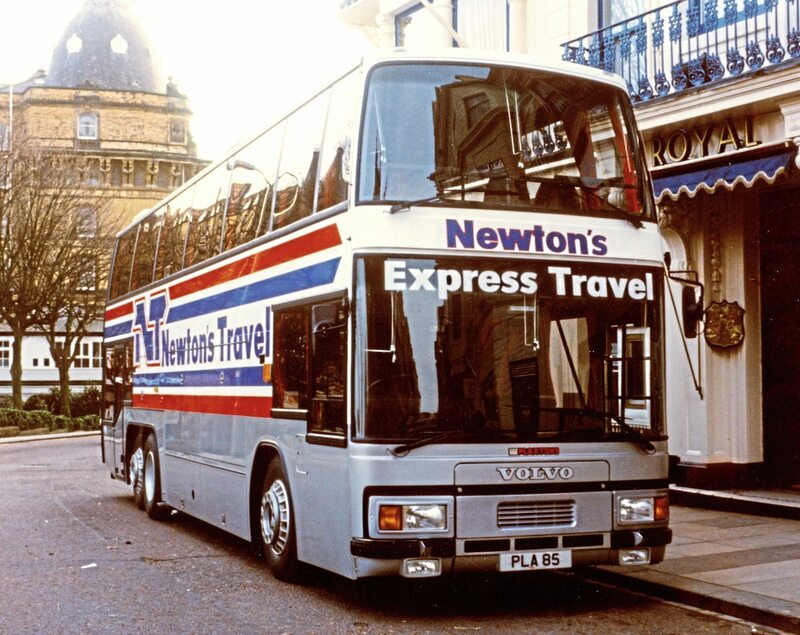 The previous model and hitherto Plaxton’s only double-deck coach was the Paramount 4000 range launched at the beginning of 1984 when the first example was supplied to Excelsior of Bournemouth when it was still owned by Vernon Maitland. Mounted on a Neoplan N722/3 underframe as used on the Neoplan Skyliner, the Paramount 4000 was later mounted on DAF SBR3000 and Scania K112CRS and K113TRB chassis or underframes. In the Neoplan, both Mercedes-Benz and Gardner engines were offered. 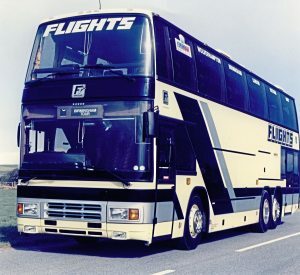 The last examples built appear to have been a trio for Martindales (who had taken the first Scania Paramount 4000), two of which had 1990 body numbers and were delivered in that year, though some 1989 series DAFs, including a Siesta Holidays example, did not enter service until late in 1991 with J-plates. Most 4000s had 55 seats on the upper deck while lower decks varied between 14 and 19 seats. Many of the Neoplans, among them batches for Ribble, Yorkshire Traction, West Yorkshire, South Wales, West Riding, and National Travel (West) carried the National white livery as did Scanias for National Travel (East), while Western SMT’s Scania trio wore Scottish Bus Group’s blue and yellow. I believe the first DAF was delivered to Parks of Hamilton in March 1987 and I recollect that this wore Wallace Arnold livery, possibly the largest coach ever to do so. A further version was the Paramount 4000RS with large central luggage area and rear lower deck lounge mounted on the tri-axle Volvo B10MT designated the B10M-53. 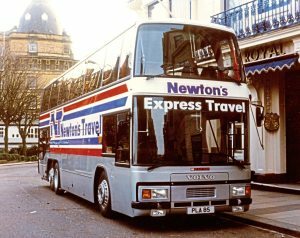 After Newton of Dingwall took the first two in 1985, the biggest customer for the RS was Flights, taking 15 between 1985 and 1989. Among other customers were Davies of Pencader and Berrys of Taunton. i. Carry long-distance pax in coach comfort, like a Panther. ii. Load pushchairs, wheelchairs, shopping bags etc as quickly as a bus, like an E400. iii. Do 62 mph comfortably, not like an E400!! The LE is the closest to this that I’ve seen, although a toilet would also be useful for journeys over an hour.